Brains or books, brains or books? Well, I am going to choose books every time. They have, in their way, a big connection to brains. So RUN—don’t stumble, stagger, or fall—to your keyboards, cars, trikes and so on; and order the special, hardcover edition of DEAD LOVE. This is why: It’s not going to last long (like anything worthwhile!). 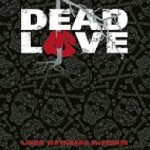 The DEAD LOVE hardcover edition will be ultra-sweet. The extremely portable goth-look tome featuring a 16-page Manga supplement will basically be PRODUCED TO ORDER, so IF YOU DON’T PRE-ORDER, you MIGHT NOT GET IT. Order lots of copies and share them!! Let me assure you, this is the perfect gift for lovers of the supernatural. If you know anyone who’s fascinated by vampires, superheroes, goth stuff, sci-fi, thrills, horror, or … yes … ZOMBIES, they are going to scream over DEAD LOVE. It is also the best possible mood inducer. 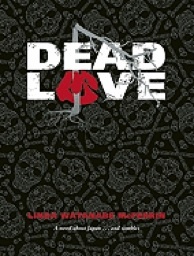 Can’t quite “get there” (physically or mentally) for Halloween and all delightfully dark occasions from which you might otherwise feel excluded, just read a bit of DEAD LOVE and you will be one with the vibe. So, if you think your creepy quotient is a little low—and I mean creepy in a cool way—you might want to get it for yourself. If you’re good with the supernatural, you won’t need convincing. It’s already you. You can find more on the Buy the Book page. For express service, the good, book loving people at Book Passage have provided this link. “Creepy Quotient” – a new self-awareness criteria – and it's associated with Halloween. Perfect. There's always something new and interesting on the Slice! Great challenge to keep up with each new entry. Don't know how you bring it each day with something new. Appreciate the effort and creativity. What'll be next?